Nikki's Fashion 411: Let's See Those Pearly Whites: Teeth Whitening That Works! Let's See Those Pearly Whites: Teeth Whitening That Works! Hello friends! Today I want to talk about a product that I have been using for the last few weeks called Smile Brilliant. This product is an easy to use at home teeth whitening kit! Being a blogger, having white teeth is important, but whitening can be time-consuming and uncomfortable. Not with Smile Brilliant! 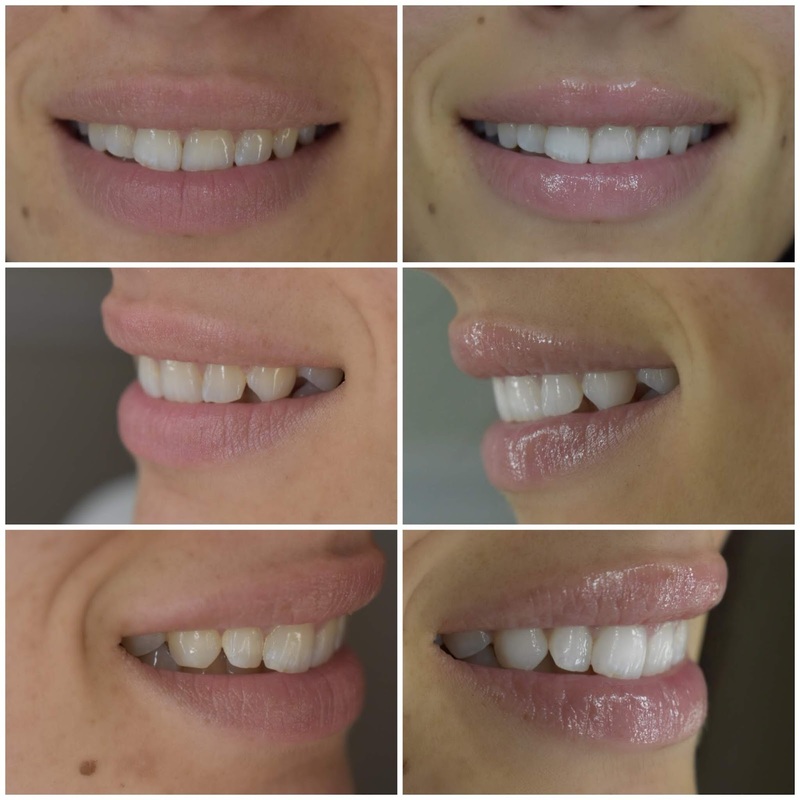 Smile Brilliant is a company made up of dental professionals who wanted to make teeth whitening easy at home. The whitening system is more affordable then heading into your dentist for a whitening treatment and super convenient for those with busy schedules (personally, I use mine when I am going to wind down and watch TV at night). The system I received includes materials to mold your teeth, 3 whitening gel syringes, and 3 desensitizing gel syringes (they do offer other packages with varying quantities). This may sound like a little, however, each syringe should last 3-4 whitening sessions. The beauty of this kit is that the whitening trays are custom made to your teeth. You simply send in your impressions and they mail back your trays within a week! This product is so easy to use. When you receive the package there are instructions inside that go step by step on how to mold your teeth. Do read these carefully as you want to make sure your impressions are accurate. Luckily, the kit does come with some extra molding material just in case you make a mistake molding. After creating your impressions, mail them in and wait for your custom-fitted whitening trays! They almost look like a retainer but are flexible. Mine fit perfectly and give me no discomfort. Unlike whitening strips, these stay in place and you almost forget you have them in. When starting your treatments make sure your tray is nice and dry. Brush your teeth with water ONLY. The instructions say to put a thin but consistent line of the whitening gel around the tray. Dry your teeth to the best of your ability and insert your trays. The instructions say you can leave the gel on for 45 minutes to 3 hours, however, the longest session I did was 1 hour. My advice is to start with the minimum amount of time for the whitening gel in order to get used to the product. Following the whitening gel, brush your teeth as normal with toothpaste and clean your trays. Again make sure they are nice and dry and follow the same steps as the desensitizing gel. This gel can stay on for 25 minutes to help with any sensitivity. After 25 minutes simply take out your trays and spit, do not brush your teeth. You want a thin layer to stay on your teeth in order for it to soak in. I really liked how easy this system was and how it was able to fit into my busy lifestyle. As I mentioned, I used the kit at night when I was going to relax for the evening. This kit really works! My teeth look so much whiter and even my husband has made comments about how nice and white my teeth look. Below are the before and after shots, do you see the difference? Now you have the chance to win your own whitening kit (149$ value!). Simply click here to enter or you can use the code nikkisfashion15 to receive 15% off your purchase on www.smilebrilliant.com I can't wait to see your results! Who Says Mermaids Don't Exist?